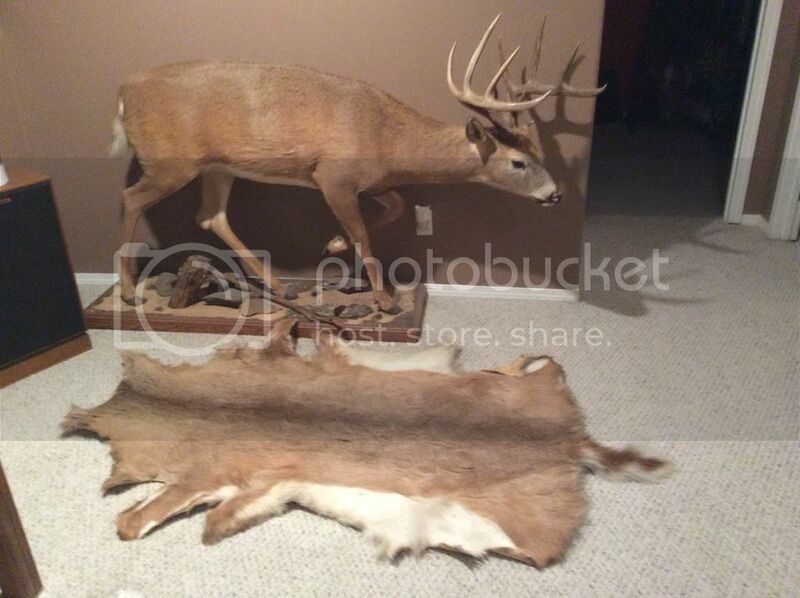 Fingers crossed I get my elk next weekend, I want to tan the hide. Would be used as a throw on a couch or bed. Ive been watching videos and reading posts for the past 2 weeks and still cant figure out a procedure list for tackling this. -Immediately take the hide off and place fur side down and spread out to cool quickly. In the meantime, finish dressing elk and get all cleaned up, quartered and hung. -Once cool lay hide on beam or flat table and proceed to flesh the hide. -Scrape off old salt and rinse hide in a solution of cold water and dish detergent. Rinse in cold water. Wring out as best as possible. -While still damp, mix up a solution of 3.5 oz neatsfeet oil, 3.5 oz warm water, and 1 oz household ammonia. -Once dry, lay hide back on table and nail and slightly stretch the hide every 6". This is all Ive got figured out based on the massive amounts of mixed information out there. Not sure if my mix recipes are correct or list of steps either. Seems to differ from source to source. I've done a few hides with hair on with good results but I don't profess to be an expert. I used that tanning formula in the orange bottle from Halfords and it worked very well. The things that immediately come to mind to me is that I never used near 25 lbs of salt, not even near that much. I fleshed the hide and salted it, making sure that it was worked into every fold, Fold it in leather on leather and rolled it up. Let sit for 24 hours and do it a second time. After doing it twice, it went into a salt bath for about 8 hours and then washed with dish soap, rinsed spread and dried. I might have done that twice, not too sure. After awhile when it wasn't wet but still damp, I applied the formula and folded and rolled it up. I don't recall exactly how long that I left it like that but I believe that it was only 24 hours. After that I spread it on plywood and secured the edges loosely to allow for it to shrink. - the length of time seems way too,long to me. I don't recall it taking me more than 3 or 4 days from start to finish. Using the formula my be different though. It's late, I'm tired and I'm depending on my memory so give me a chance to read what I wrote in the morning and I'll double check everything. The process may be completely different from what I used but what you described sounds a lot different from what I did. x2 on the tanning kit! i've done about a dozen critters with ez-100 (got it out of the states) it works really well. and it is a washable tan where lutan f is not. lutan is still a great product. one thing regardless of what tannage you choose is to shave down the skin as thin as possible without cutting into the roots. a regular thick elk hide will not soften near as much without shaving the skin. this can be done with a good sharp fleshing knife, although it does take time and patience! shave the skin from the tail to the head as this will be in the direction of the hair growth and you won't cut through as easily. if you do use lutan or liqua tan or similar there are different procedures for tanning with these products so make sure you check them out if you use them. I know nothing about this & am reading purely for interest. Are you certain you would wring it? Seems like you'd want to avoid wringing to as not to distort/stretch the hide. Maybe 'press the water out as best as possible' instead? I figured that you wanted to go old school but for sure, the tanning solution is one hell of a lot easier. I'm currently at step 4 of putting a beaver pelt in a salt bath over night, just letting the boiling water disolve the salt and get cool before putting the pelt in it. I'm not sure if you can read the instructions. I thinned my hides with a wire wheel on a drill but they are still a little stiff, great for wall hangers. The stuff that I use is from Halfords and is called "Deer Hunter's and Trapper's - Hide Tanning Formula". I think it's around $15. One bottle will do 1 deer....3 to 6 bottles for elk and moose. The hide will shrink when it dries so stretching isn't an issue. Pulling the hair out might be if you are too rough though. Would any of these be better than the other, and what sort of preparation one would need for the hide? The hide from a buck that I shot in the neck on the floor is one that I did with the tanning formula. I fleshed it with my hunting knife....lol. It's about 10 years old and no hair slipping at all. I had it on the back of a couch but my Daughter recently got her own place and we gave her the couch that it was on. I've done coyote, beaver and weasel with it so far and they all turned out good. Might have to use that too. Have you tried any other types of tans? How soft did your deer hide come out as and how much did you have to work it afterwards? What kind of wire wheel? Just an attachment for the grinder I suppose would work fine? And then curious as to the warm water. Is it better to use cold water instead and dry in a cooler environment to decrease bacteria growth? I didn't know the first thing about tanning and I just went by the very easy to follow instructions on the side of the bottle. If you follow it step by step, it works. I've never had a reason to try anything else. Just an ordinary 4" wire wheel to soften the hide works. Mine is not supple because initially I had it as a wall hanger and a little stiff was ideal. The longer you go over it with the wire wheel, it's supposed to get more supple. Not sure what you mean about warm water? Last night I put in 1 lb of salt and I gallon of boiling water to desolve the salt and before putting the beaver pelt in I let the water cool, as in cold water. It's pretty cool here at night in the shack so the water was very cold this morning. The weather here is ideal for tanning in a garage or shed, it stays cool all day. Get yourself abdeerbhide or two from people that would normally throw them in the bush just to get the experience and a couple under your belt. I saw the bottles today at Halfords, $17 each. The only warm water that I used for my beaver pelt was washing it twice in dish soap to get the grease off and then a cold water rinse twice. It's hanging to dry a bit right now and tomorrow the formula goes on. I've used the tanning formula on beaver squirrel and marten. Everything works well on the thin hides. Beaver is another story. You need to thin them in the thick spots. Thes best luck I've had is brain tanning them. I like the idea of an authentic, natural tan as well. That is so nice. I might try brain tanning one day but for now I'm just too busy to take that on. I've done a couple of beaver but the pelt is not supple, it's more stiff than the deer hide. No good for hats or mitts but great for wall hangers. My next experiment is taxidermy of a mink. I have a nice pelt and just have to find a form and eyes. Probably not until Spring as I'm getting the mink professionally tanned. EDIT - wire wheel on beaver is easy when it's still nailed to the board. The fur prices have helped me expand my horizons. I would have never tried to tan a beaver at $80, but for 20-40 why not. Thin hides like marten/coyote/etc no problem. I picked up pig brain from a local butcher and followed various instructions from brain tan.com. The work comes in the breaking/softening. Be ready for a workout. just to add to the discussion here. i've found that if you want a soft flexible hide, using a good tanning oil after you have tanned the hide will help it with softness quite a bit! some i have used after tanning with liqua tan and ez-100 are liqua-soft and Tanning oil #1, i picked them up at aaa supply house in calgary. 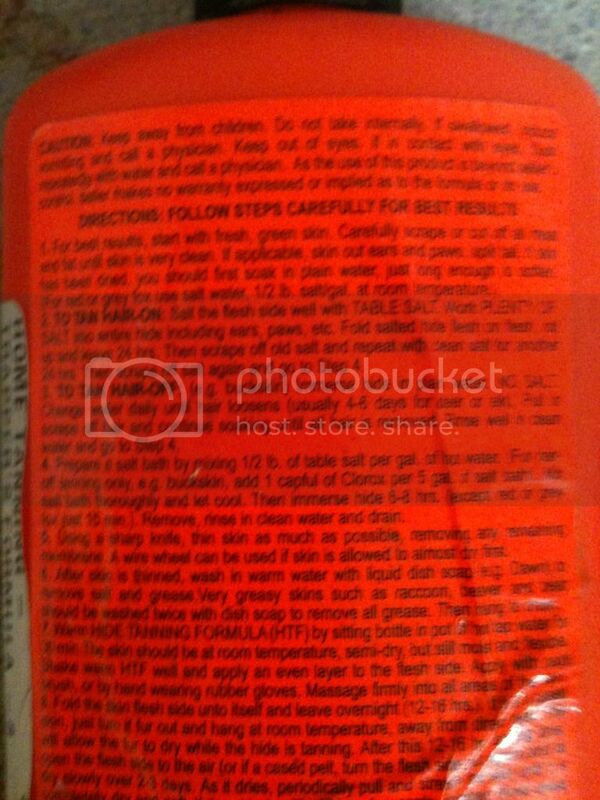 grab a bottle of the orange stuff or pick up a liqua tan kit and follow the instructions exactly. you shouldn't have too much trouble.